We had a long weekend in September. It was the girls’ school holidays too. SP and I planned short weekend getaway, about 2.5 hours away from home at Rye . Only we didn’t tell the girls. SP picked me up from work – we finished packing quickly and then picked up the girls from Holiday care and told them that we are going for a long drive and dinner at a far-away restaurant, to bring in the long weekend. As we kept driving, the girls got tired and suggested, that may be we should find a hotel and stay there for the night and then come back the next day. ” No! May be we can go away tomorrow.” SP offered. They were quite happy with that. Finally we reached our destination. We did stop at a gas station and got snacks for the girls, because they were getting hungry. SP pulled into what looked like a shoddy car park. I had to stop myself from having a mini-meltdown because I was actually expecting a fancy resort. The name had the word ‘ resort’ in it! Anyway, I stayed in the car, while SP went to get the keys. He was a little disappointed himself and my shocked face, couldn’t have helped. I told the girls are recorded their reaction. They were excited, there was lot of squealing, screaming. MsAn was even worried about our house and thought for a moment that we were moving there. Anyway, we went upstairs to our room and it was the cutest, most basic but very well kept unit ever. The girls room had two single beds and they were on the top of the world! Even today, MsAn asked us if we could go back to our little hotel,again. She also said the best thing about the holiday was the cutest little puppy that took a liking to us.As for us, it was a well deserved break. Both SP and I were overworked.His traveling was making me cranky and tired. So, this break was just what we needed. 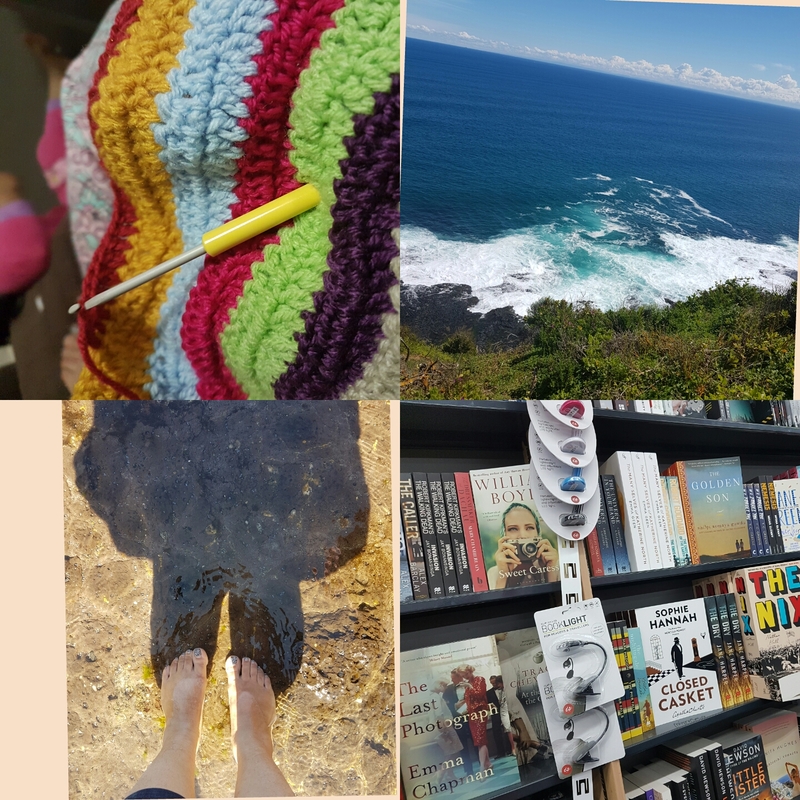 All the things that made me happy can be summed up in the collage attached – Time to crochet, endless sea-gazing,rock pools and little bookstores. It was a bonus that I found some nice books on sale . A weekend well spent! Lovely pics!